Come on out to the Old Kingston Shirt Factory in Kingston, NY October 16th for a night of Frightfully great entertainment. The Shirt Factory is home to over 40 Eclectic Artists and entrepreneurs. Take a stroll around the old brick building which was built in 1917. Take in all of the Hauntingly spectacular decorations and life size spooky wax Dioramas by Artist Sigrid Sarda. The Halloween Art exhibit will be showing original work from Amazing Halloween Artists, Shop for one of a kind Original Halloween paintings,sculptures,functional art pieces,jewelry and prints. Dj Crazy Frog will be playing top Monster Mash-ups all night long. hypnotised by his Light show you need to keep up sooo wear comfortable shoes or none at all for those lazy eyed zombies. www.Psychocharger.com…. Not in the Halloween mood this band will get you there!! Hacunda the Haunted will be doing one on one tarot readings all night long. Halloween / Ghost readings by Jessica and freinds of Half Moon Books. A full Candy bar will be provided by Michaels Candy Corner. A feast of sweets to make anyone’s eyes boggle. Don’t forget about the candy Zombie girls staggering about! A Witches Brew Bar provided by Villa Carmella will be serving bloody reds, ghostly Whites, and the Madman’s top choice of beers. After you have made it past the nagging witch, have a try at one of our ghastly games…Including a Witch Hunt(times for Witch Hunt will be posted in front lobby)!! After you have had your go at the games don’t forget about your Zombie Prom Photos! This is just some of the great entertainment that the Madman’s Masquerade holds for the night of October 16th. You will just have to stop by and experience it yourself. $10.00 cover charge 7pm-12am for all the SPOOKTACULAR Entertainment! Its Friday September 3rd beautiful morning tempetures are dropping here in the east and Fall is right around the corner. I am painting up a storm for the Hudson Valley Garlic festival this year. I am happy to say I will have much more originals and prints to offer then past years. If you plan on visiting me at the Garlic festival your best bet is to get there early Saturday morning of September 25th. My booth will be packed with Spooky paintings, clocks, boxes, sculptures, and prints. I can’t wait to see you all once again this year, hands down the Garlic Festival is my most favorite show!! 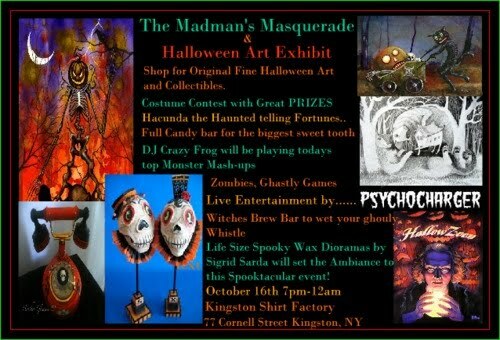 Please dont forget about the Madman’s Masquerade and Halloween Art Exhibit that I am curating myself on October 16th at the Kingston Shirt Factory. So much fangtastic fun for this evening. Please read more about the event below on my blog you dont want to miss this one!!! A few more things, If some of you are wondering what had happened to my ebay store, I no longer have the store up. As Ebay has slowed tremendously over the past year.I will be offering an occassional auction. My work can be found on Etsy which is linked here on my website. Just click the buy stuff button at the top of the page. of course you can always purchase from my website as well. I hope everyone has a Great Labor day weekend.